You will have to bear with me - it is more of a "talking to myself trying to make sense of what just happened" kind of post. As it can be seen, the biggest hit took infrastructure play stocks ( Say "Hi" to PETE NAJARIAN A.K.A. "Coal IS A REAL STORY" and Co. for me ) http://trading-to-win.blogspot.com/2008/07/faces-to-remember.html. ), yet another biotech - VRTX, "United Idiots of the World common play (SIRI), "Cannot stir sugar myself" (HANS), few chips stocks ( wireless, mostly - "Hi Pete" ). Overall nasty day for NASDAQ if you ask me Adv/Decl 35/62, vol 268/620, but wait - why is that Puts/Calls Ratio on declining issues = .89? Which is bullish? Is it? Flipping through intraday charts - what do we have here? Most of the selling took place from 9:30 till noon, non stop, rapid fire, "fire-sale" kind of selling - on EVERYTHING, after that a lot of NASDAQ100 issues managed to recover. All righty then - let see was that selloff panicky as on huge volume? Nope - no volume whatsoever, about 60% of average volume on most of .NDX issues up or down. That just does not look appropriate for bearish cancellation of prior bullish pattern - faked breakout? Could be that rumors of "some huge hedge fund forced liquidation due to blown away natural gas position" be true? It is kind of looks like "fire-sale" with no $VIX spike, no panic, but that sure confused lots of "small timers" and rat races started for the day. We'll have to live to see another day - as of now - I am not sure we saw what we thought we saw. Here is a chart of QQQQ I've been using for the last few months, most price levels being there for the same time, no moving around tricks. 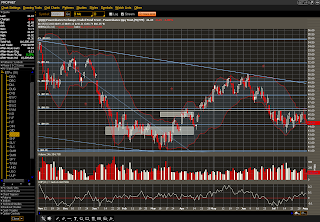 QQQQ is stuck right above 23.60% Fib of $44.26 and that same area served as resistance/support back in February - March. White priceline is exactly at $46 - it's been there since February. Is that what PCE deflator was telling this morning? But it is lagging and with crashing commodities prices... Is that why financials held up so well today? I'm reading: Aug 4th '08 Market Thoughts $$Tweet this!